The Firefox 4 introduces hardware acceleration support which enables usage of GPU (graphics adapter card) to render images, animations, graphics and videos for faster browser performance especially when loading web pages with rich media contents. However, not all people is benefiting from hardware acceleration though, especially on system which has graphics card which does not support Direct2D and/or DirectWrite. In addition, hardware acceleration also may cause font display issues on Firefox 4. Firefox 4 enables and turns on hardware acceleration on GPU by default. If need to, here’s the way to disable, turn off and deactivate hardware acceleration support in Firefox 4. In Firefox, click on Firefox button, and then Options. 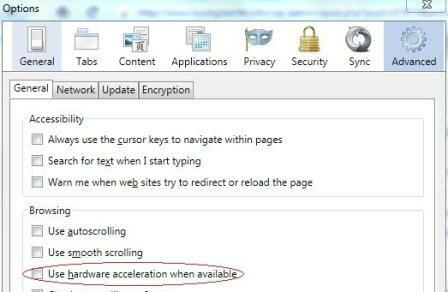 Unselect and untick the check box of Use hardware acceleration when available option.